If you have student debt, you understand why it has become a national crisis over the last decade. 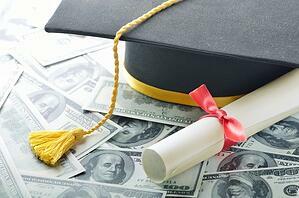 The average college debt is currently more than $37,000, with an average monthly payment of nearly $400. Whether you have approached your parents or others for advice, they might not fully understand your dilemma. Their experience with college debt is likely vastly different from what you are struggling with today. That’s because the student debt crisis today has become shockingly different in only the past 10 years. Since 2008, federally owned student debt has increased from about 5 percent of total household debt to approximately 30 percent. Relative to national income, student debt has increased by 400 percent! How did this happen? Studies point to the housing crisis. Since the housing and financial crisis began in 2008, college enrollment increased only 4 percent, while tuition increased 37 percent over the last decade. For students who started college after 2007, they suffered the one-two punch of having to borrow more because their parents were less able to support them, and they were unable to pay back their loans during the years of a weak labor market. So take courage that because you have more college debt than your parents, you didn’t unwittingly make a terrible miscalculation in how you handled your college financing. You faced an environment unlike any our society has seen before. And with that in mind, it’s time to hop off the student debt treadmill and take control of your life by taking a few steps toward financial freedom. You can’t really plan for your future until you rid yourself of student loan debt, but it can be done, in no more than nine years. If you are struggling with making student loan payments, it’s essential to find a solution immediately so you don't default. The government will not hesitate to garnish your wages, which would create a greater financial burden. Last year, the Treasury Department garnished nearly $3 billion in wages from those in default on their student loans. Every day you delay dealing with your student debt, you waste opportunities for long-term prosperity and drag out the period of time you live with significant financial pressure. In March, President Trump signed a $350-million one-time expansion for a federal program that forgives student debt, meaning thousands more teachers, police officers, nurses or others in public service jobs can receive debt relief. It’s important to familiarize yourself with the difference between student debt forgiveness, cancellation and discharge. They each work differently and are beneficial for different circumstances.Review all government materials for plans that can benefit you - a few hours of research can mean thousands of dollars of debt relief. Also check for local state programs. Many states have found federal plans inadequate and enacted local programs to fill the gaps. For instance, in Kentucky, doctors can have their loans forgiven if they practice in certain parts of the state. You can find a list of all state debt relief programs here. According to CNN Money, more than the 44 million-plus Americans have a side hustle to supplement their main income, and in many cases, they are using this extra income to pay down student debt. The number of side gigs has grown exponentially in the last five years, and far beyond the ubiquitous Uber car-sharing app. People can now use their spare time to earn money running errands, shopping and delivering groceries, and doing handyman work. This article on the 50 Best Gig Economy Apps can give you more ideas. There are volunteer opportunities with many organizations that will help you get rid of your student debt. You could assist with disaster relief or even a political cause and earn money toward your debt relief. You can find a list of such programs at sponsorchange.org. The Shared Harvest Fund is also now in operation, allowing people with student debt to create a profile and list the social causes they're interested in, such as gender equality or homelessness, and be matched with nonprofits and businesses that pay a monthly stipend between $250 and $1,000. You need a plan that addresses your unique situation. According to the New York Times, even small mistakes can send you skidding into default. Loan companies have been documented by the Consumer Financial Protection Bureau and Government Accountability Office to have a history of misdirecting payments, losing paperwork and applying the wrong interest rate. The rules can be complicated, and you need to use every tool at your disposal to make sure you are doing the right thing to most quickly eliminate your debt. A carefully designed study at Princeton University found that simply being placed in an income-based repayment program decreased loan delinquency by 21 percentage points, to practically zero. Those enrolled in the income-based program were paying down their student loans faster than those who were enrolled in standard fixed-payment plans. You don’t want a financial planner whose expertise is limited to helping people maximize their wealth, because you need a different strategy right now. You need a financial planner who has the freedom to prioritize your needs over the needs of financial institutions and has access to every tool available. Look for a financial consultant who can help you capture every dollar you are currently losing to debt, interest and taxes, and get you off the treadmill of debt and into the circle of increasing wealth. In fact, we offer a free consultation to show you how you can eliminate your debt in nine years or less. The most important thing you need to understand is, if you don’t have a plan to get rid of your student loans right now, you’re getting deeper in the hole with them. Because student debt doesn’t wait for you to make it a priority, it will get bigger every month until it makes itself your priority. Decide today to start taking these steps to take control of your life. Call The McGriff Alliance, who specializes in fast-track debt resolution, work hard and keep a good attitude. You will be grateful to yourself for the rest of your life.